Based off the flagship Premier II model, the Les Baer Hemi 572 combines Baer’s passion for high performance guns and high performance cars. Inspired by Chrysler's fast and fearsome 1970 Hemi Cuda, the Hemi 572 combines classic lines and high tech features including adjustable rear sights, green fiber optic front sight, hex head grip screws, ambidextrous safety, aggressive VZ black recon grips, complete hard chrome finish, Dupont S coating on slide stop, ambi safety, mag catch and mag catch lock, hammer, trigger, barrel, plunger tube, hammer pin, sear pin, recoil plug, and hex head grip screws. Guaranteed to shoot 3” groups at 50yds. 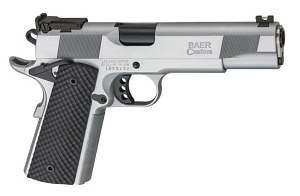 Like the Hemi Cuda, the Baer Hemi 572 is sure to perform as well as turn heads.